There are plenty of theories related to the Game of Thrones universe, and if there’s one thing we know about George R.R. Martin, the author of the Song of Ice and Fire series, it’s that he loves shooting down fan theories. 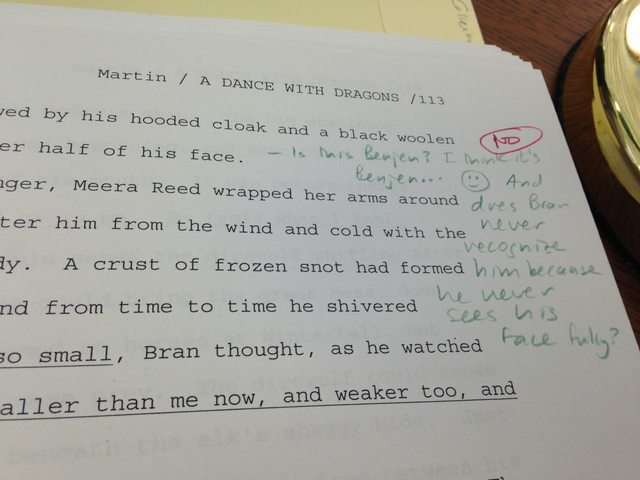 Apparently, he even liked to do this when it was his editor reading an original draft of the book. This week, a fan took a peek at the 1600-page copy of A Dance with Dragons that happens to be housed at Texas A&M library. According to the photo the Reddit user shot, a fan favorite theory about the characters has been shot down. Check it out, below. Granted, HBO’s fantasy drama doesn’t always follow the same paths as George R.R. Martin intends in his books, so I suppose the theory could potentially still hold up. Additionally, since George R.R. Martin doesn’t always tie up loose ends, I wouldn’t be surprised if we never learn Uncle Benjen’s fate, at all. George R.R. Martin may not always enjoy tying up loose ends, but sometimes he does enjoy shooting down fan theories, like the one above with his editor. Recently he also spoke out regarding the conspiracy theory that he may have actually completed all of the books in the Song of Ice and Fire series. While there may not be a new book coming anytime soon, we will be getting Season 5 of Game of Thrones on April 12. Additionally, here’s everything we know so far about the new season of the show.